By focusing on his memories of horses, sheep, goats and alpacas, of goldfish, turtles, cats and dogs, and of mice, deer, a loon and a fox, he gives us a peripheral, loving portrait of the people who crowd his family and his community. 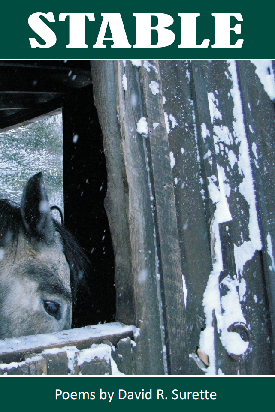 Unlike the first horse stall he built, every one of the poems in STABLE is level and plumb. Though rooted in the grit of a life among domestic and wild animals, these poems in David Surette's STABLE are charged with imagination and heart..Poem by poem, we are reminded as we walk among animals and each other that "the open hand is as strong as the fist." Very little is right about the first stall. real 2x4�s, 2x6�s, � inch panels. Ben drew up the plans in a dusty spiral notebook. I built it alone, and it�s neither square nor plumb. with the level, the saw, the drill, hammer and nail. The last stall is nothing to be ashamed of. hoping for a fair price. Then the girls bought two foals. I rebuilt that damaged stall from the studs up. if I want to be equine free. A stable stall is a heart to be filled.